Hail, elves. It's been a while since we've had a mechanics update, so I'd like to cover a variety of topics today: the basics of our "non-core" classes, our cooldown system (or lack thereof), an update on how attacks are resolved, and another update on the evolution of our armor system. I'd also like to show you a dungeon tileset test render and some sweet shakycam of some of the combat basics running in engine. We also have modal abilities that can be turned on and off at will, with some abilities being exclusive to others, meaning you can only have one active at a time. I've talked about this a bunch on the forums, but not in an update. All attacks in Project Eternity compare the attacker's Accuracy value to one of four defenses: Deflection (direct melee and ranged attacks), Fortitude (body system attacks like poison and disease), Reflexes (area of effect damage attacks), and Willpower (mental attacks). A Hit is the standard damage and duration effects, a Graze is 50% minimum damage or duration, a Critical Hit is 150% maximum damage or duration, and a Miss has no effect. In a balanced Attack and defense scenario, the majority of attacks wind up being Hits or Grazes. If the Accuracy and defense values are out of balance, the windows for each result shift accordingly, while always allowing for the possibility of a Graze or a Hit at the extreme ends of the spectrum. We've previously talked about how different weapon damage types (Slash, Crush, and Pierce) fare against Damage Threshold (DT) in the game. We implemented that system and found that while it worked well on paper and scaled well, it was unintuitive when put into the game. It was not possible for players to make informed decisions about what weapons to use against a given armor type because doing so required making relative damage vs. DT calculations for all weapon types, i.e. having a spreadsheet open for comparison at all times. In light of this, we are going to try a more explicit damage type vs. armor type model where armor, regardless of its DT, has a familiar weight classification: Light, Medium, and Heavy. Damage types are either good or bad against a given weight classification. When a damage type is "bad" against an armor type, it does half damage before DT is applied, making it very inefficient. Within the "good" types of damage, there's still an efficiency curve against DT for meticulous players to figure out, but it has less impact than avoiding "bad" damage types in the first place. Energy-based attacks (like most spells) oppose a different characteristic of the armor, its substance type (Natural, Armor, or Spirit) and like damage types, have good and bad opposition characteristics. Weapon bonus damage that is energy-based is applied to the target separately, but at a fractional DT value matching the bonus damage. E.g. if a sword has a fire effect that does +15% the sword's damage, it is opposed by 15% of the target's Damage Threshold. 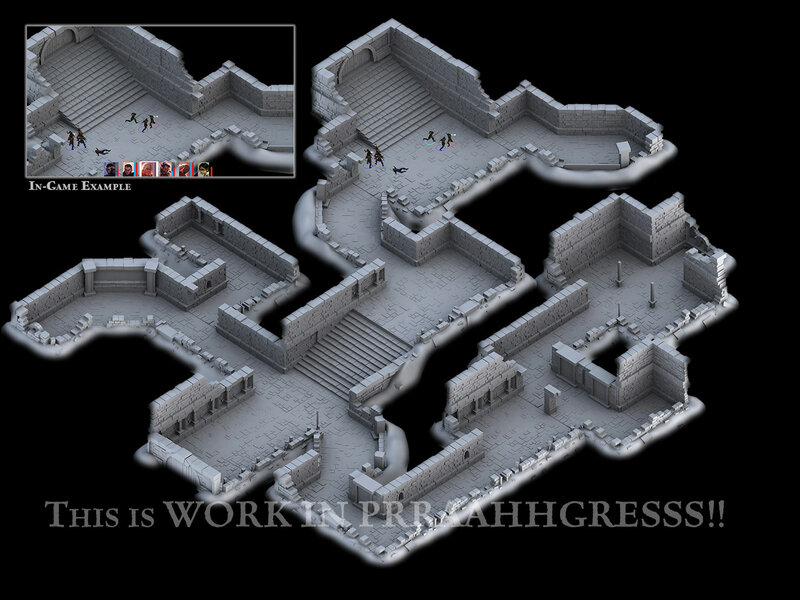 Environment artist Sean Dunny has been experimenting with building tilesets for our dungeons. "Tilesets?!" you may be saying (or thinking). 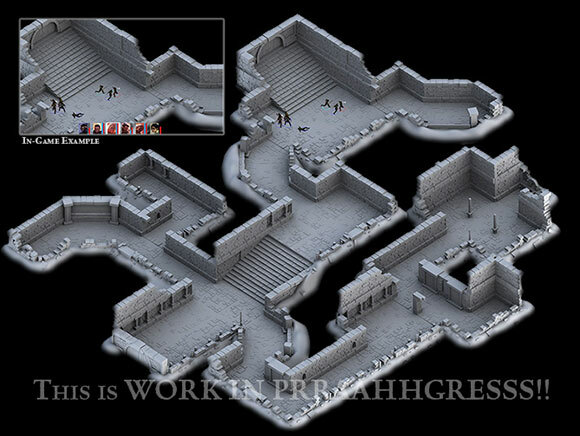 It may be a surprise, but many Icewind Dale and Planescape: Torment levels started from a tileset or modular unit base. We use these tilesets to generate basic renders for testing layout, navigation, and combat. Once we like the basic layout, we refine it by adding additional "meta" (special) tiles, modifying the tiles individually in the layout, adding lights, and of course having an artist do a 2D touchup pass. I want to see the game as it plays!!! Can't you just zoom in a little more? Thanks for the deetz. I did have a few question: can you expand on what you meant about the Grimoires being inventory based? Would this be like switching between weapon sets (just with a lot longer animation?) reaching your top of pack or having to scrounge in your stash? Also I'm a little confused about energy attacks: Would a fire sword (normal damage 5-10 with an energy attack of +15%) have to clear a DT based on the armor for the normal attack and clear a different DT for the energy attack? That is to say would a Spirit Heavy Armor have a different effect than a Natural Heavy Armor (or its equivalent)? What will be the limiting factor when activating/deactivating modal abilities. Is a mana limit/timer on these? Edited by Hormalakh, 22 January 2013 - 06:47 PM. The chanter having phrases which they can blend to create relatively uinque effects is deeply intriguing. I certainly have liked everything thus far, but that bit of information was deeply encouraging that you guys are currently crafting a game which will outdo even the legacy of Baldur's Gate. Excellent work. Worth every penny--as if there were any doubt! Edited by Mr. Magniloquent, 22 January 2013 - 06:42 PM. Right, hey dude, you who some time ago suggested the Roguelike minigame for Endless Paths. You were wondering how tiles would work. Being "Inventory base" seems to me like it's "top of the pack", which means you can't access them during combat. That explains why there would be no cooldowns. Ah, paladins have an in-combat "rez" so to speak (I know, it's not). Interesting. Chanters already sound more useful than bards. And it sounds like Barbarians have a skill to allow beeline support towards, if necessary, an enemy targeting a weaker party member. I wonder--I'm not in favor of actual aggro/threat mechanics in a game like this, but some ability to interfere with an enemy's current targeting would be interesting, if possible. We also have modal abilities that can be turned on and off at will, with some abilities being exclusive to others, meaning you can only have one active at a time. >> The quoting function is seriously screwy. Anyway, this sounds like toggle "stances" or similar, with particular passive effects turned on when in specific stances. Or something. Mm okay. I just hope whatever quickslot/weapon swap functionality will be kinda forgiving; I certainly wouldn't want to see something along the lines of the extreme DDO scenario, but so long as there aren't any/many instances of outright immunity, sounds good to me. Would a ranger have to have an animal companion? I'm curious as to whether or not the bond with the animal and ranger is so close, that if the animal died, the ranger would die as well. Hopefully it would just entail a hit on the health as opposed to a kill. LOL: it didn't pass my notice Sounds like its possible afterall! Modders get your engines started. As for chanters: They remind me of the fridge-magnet poem words. Suggestive and innuendo chants coming soon to a PE near you. Edited by Hormalakh, 22 January 2013 - 07:13 PM. I'm sure that this will be addressed in a future video, but I'm really more interested in the role-playing aspect of the game. As in, will I be able to avoid fights by using diplomacy (as was largely the case in Torment), will there be an alignment/karma system, how much will my fame/infamy affect the way people treat me - you know, stuff like that. It might be interesting to have Grimoires act like a weapon. Then you switch between Grimoires or weapons and the animations could vary (from Grimore -> weapon: short animation duration. Weapon -> Grimoire: long animation. Grimoire -> Grimoire: long animation). Thus grimoires can limit how many weapons a character can carry (the more Grimoires you carry, the less likely you are able to carry a weapon) and the limit on Grimoires also stays. Edited by Hormalakh, 22 January 2013 - 07:10 PM. Check the past updates and interviews. I suppose that would be a natural balance limiter for players who want more combat-oriented mages. Can't have all the super duper level 9 mage spells and dual-wield axes. And hopefully they're all gone. You equip Grimoire A, and all your spells' durations are increased (at the loss of any of the other grimoire's effects). You switch to Grimoire B, and you lose the duration bonus from A, but now all your spells' projectiles travel faster and your cast times are reduced. Grimoire C increases all spell ranges and adds additional targets to multi-target spells, etc. Just my 1 silver, 7 copper (inflation!). (EDIT): Also...! I hope Barbarians plow through anything in their path in the midst of that "ignoring all hazards along the way," in a straight line, meaning that Wild Sprint will be a very positionally-tactical ability. And maybe they get some abilities that are more effective the more foes they're surrounded by. Edited by Lephys, 22 January 2013 - 07:32 PM. Ciphers: Geometric upscaling could be one "ability." Geometric downscaling could be another. Psionic Nexus: The more "sentient beings" within an area, the more powerful the attack. As beings go unconscious/die, the power of this ability/attack decreases. This encourages players to try to keep as many enemies alive, while reducing their stamina (of all enemies) equally. It is counter-intuitive since most players like destroying enemies one at a time and reducing the number of enemies attacking. It is sort of a balance question (should I kill off these enemies and start focusing down on single enemies or should I keep the minions alive to help power-up my ability?). You can further adjust this based on monster intellect/wisdom/charisma. Other adjustments could be made. The point is this attack goes from very strong to fairly weak over the combat duration. Edited by Hormalakh, 22 January 2013 - 07:38 PM. Chanters sound really cool, I like the idea of using phrases to craft songs. Curious if summoned Monsters will work like Ranger Animal companions. I'm looking forward to more lore on the classes and races. I wonder if that means the wizard/caster tier-lockout "cooldowns" that Josh described before are out; those weren't per-encounter but under specific timers, theoretically. I think that could add an interesting tactical layer on top of per-encounter and per-rest if the timers were tweaked, anyway, but making regular spells per-encounter would be a good enough resource shift for the original intention, probably.